"The cool thing about the Flashback and the reverb pedal is two years ago I put these in Joe's rack. And they're still in here. The cool thing about that is that Joe changes weekly. I mean it's every week that we're changing to a new reverb. I've got boxes of reverb and delay pedals that I used to change weekly. And now we're all set and good to go. I can close the drawer, click it in place, and we're laughin'! So to TC I say: Thank You," explains Joe Perry's guitar tech. Listed on his TC Electronic artist profile page. 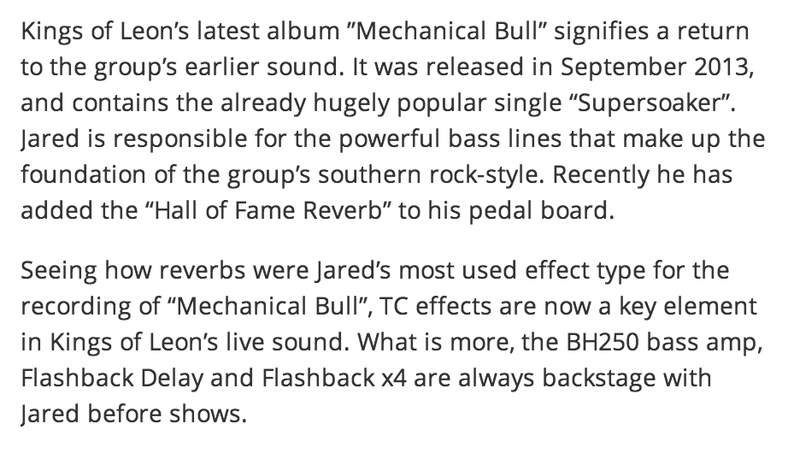 Quote from the article: "Seeing how reverbs were Jared’s most used effect type for the recording of “Mechanical Bull”, TC effects are now a key element in Kings of Leon’s live sound. What is more, the BH250 bass amp and Flashback x4 are always backstage with Jared before shows." Original source found [here](http://www.tcelectronic.com/jared-followill/). Albert uses a Flashback Delay pedal, according to TC Electronic's [website](http://www.tcelectronic.com/albert-lee/). Among Scott Ian's pedals, a TC Flashback can be seen, at 0:36 in this video. Troy Van Leeuwen uses a TC Electronic Flashback Delay pedal, according to TC Electronic's [website](http://www.tcelectronic.com/troy-van-leeuwen/). As of 0:31 in this video, Devin's pedalboard can be seen. Among the different effect pedals there is a TC Electronic Flashback. The TC Electronic TonePrint Flashback Delay is listed among the products used by Doug Aldrich on [this page](http://www.tcelectronic.com/doug-aldrich/) of TC Electronic's website. At 1:10, Rudess demonstrates his delay toneprint, FlashWiz. On his twitter account, he posted this phote which includes many other pedals. 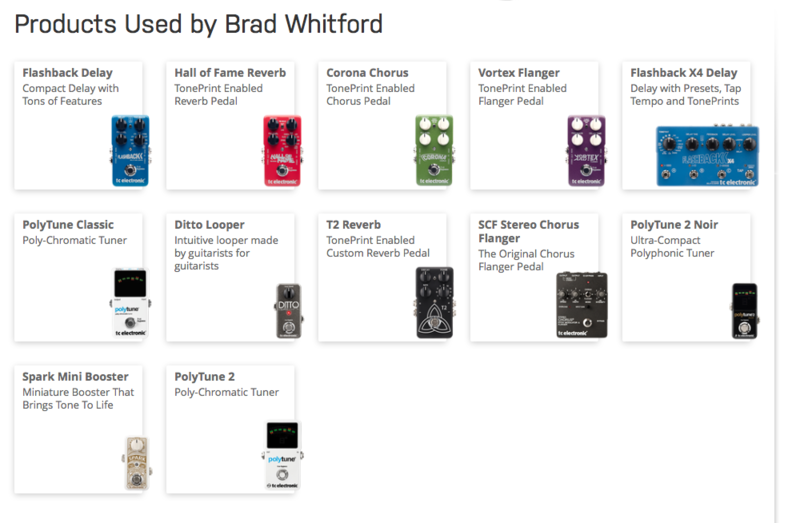 Brad uses a Flashback Delay pedal, according to TC Electronic's [website](http://www.tcelectronic.com/brad-whitford/). Steve talks about his rig on GuitarPlayer (http://www.guitarplayer.com/artists/1013/steve-lukather-celebrates-toto-ringo--a-new-solo-album/23753). On Steve's official site (http://www.stevelukather.com/artist/gear.aspx) you can see his brand new pedalboard. TC Electronic's [website](http://www.tcelectronic.com/bumblefoot/) lists their Flashback Delay pedal as one of the products used by Bumblefoot. "I'm a lover of gear and have been collecting guitars, amps and pedals along with outboard gear for years"
At 11:00 of this rig rundown the TC Electronic Flashback Delay TonePrint Series Guitar Effects Pedal is show on the pedal board of Ryan Roxie of [Slash's Snakepit](http://equipboard.com/band/slash-s-snakepit). Here's a pic of all our pedal boards. @officialmyleskennedy on top and @markttremonti bottom. Mine is super exciting in the middle ???? One of the TC Electronic products used by Andreas Kisser is the Flashback Delay, according to [this page](http://www.tcelectronic.com/andreas-kisser/) of TC Electronic's website. Billy uses a Flashback Delay pedal, according to [TC Electronic](http://www.tcelectronic.com/billy-morrison/). According to the product website Dave LaRue uses the Flashback delay pedal. A TC Electronic Flashback can be seen at 2:07, for example. According to the product website Vernon Reid uses the Flashback delay pedal. 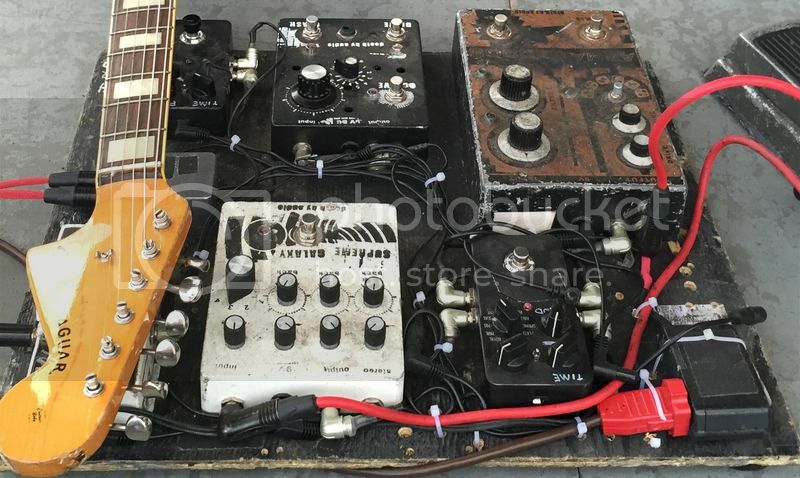 A TC Electronic Flashback Delay pedal can be seen on Henry Kaiser's pedalboard in this photo, found on [Vertex Effects](https://www.vertexeffects.com/blog/henry-kaiser-pedalboard_2). At the official TC Electronic page we can see that he uses a Flashback Delay. TC Electronic's site states that this pedal is part of Peter Haye's equipment. View an entire collection of TC Electronic pedals Bill Kelliher of [Lethargy](http://equipboard.com/band/lethargy), [Today Is The Day](http://equipboard.com/band/today-is-the-day), and [Mastadon](http://equipboard.com/band/mastodon) uses on this [artist page](http://www.tcelectronic.com/bill-kelliher/). Among them being the TC Electronic Flashback Delay TonePrint Series. The Flashback Delay TonePrint pedal is one of the TC Electronic products used by Brian Welch, according to [this page](http://www.tcelectronic.com/brian-head-welch/) of their website. Joe Trohman's guitar tech, Josh Newton, says that Joe uses two of these TC Electronic Flashback Delay TonePrint Series Guitar Effects pedals as a fast and a slow delay. Alex Rosmilia's rig displays a TC Electronic Flashback Delay, shown on this spread from a Premier Guitar article. 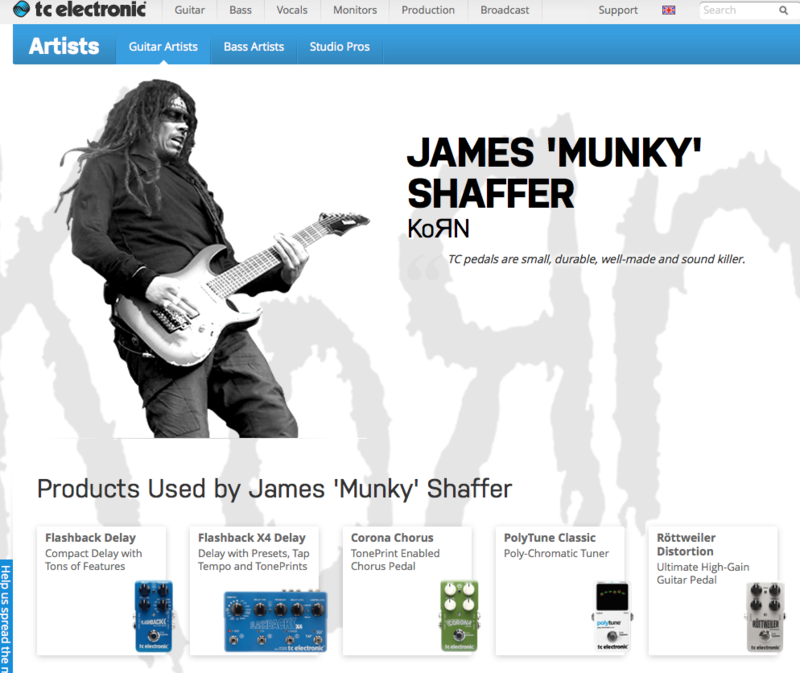 On this [artist page](http://www.tcelectronic.com/james-munky-shaffer/) for James Shaffer of [Korn](http://equipboard.com/band/korn) from the TC Electronics website, displays some of his guitar pedals, including a TC Electronic Flashback Delay TonePrint Series Guitar Effects Pedal. 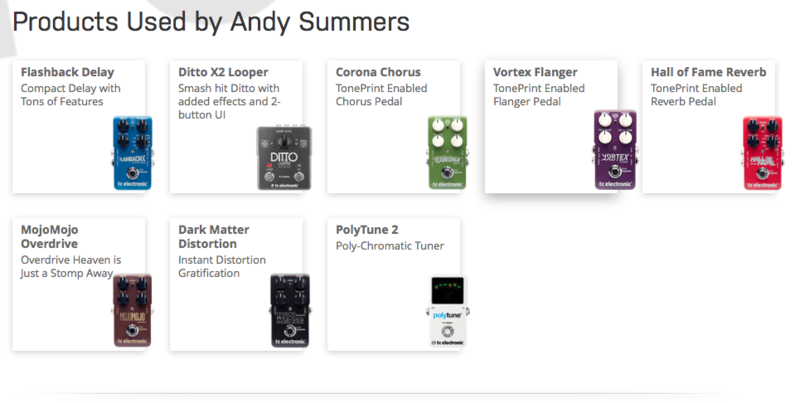 On [TC's website](http://www.tcelectronic.com/andy-summers/), the TC Electronic Flashback Delay pedals is listed among the TC Electronic products Andy Summers uses. In this video, Steve Morse uses a TC Electronic Flashback Delay & Loooper. The description reads, "Steve Morse of Deep Purple, Dixie Dregs, etc. is creating his personal TonePrints for TC Electronic's Flashback Delay & Looper guitar effects pedal. He really likes what he hears at first, which is always a good starting point, and as he gets to mess around with the many parameters, he simply succeeds in creating his dream delay - a delay sound that he can't get anywhere else as he puts it!" Bill uses a Flashback Delay pedal, according to TC Electronic's [website](http://www.tcelectronic.com/bill-reynolds/). The Flashback Delay pedal is on of the TC Electronic products used by Sune Rose Wagner, according to their website, on [this page](http://www.tcelectronic.com/sune-rose-wagner). At 4:54 in this Premier Guitar [interview](https://www.youtube.com/watch?v=9Fp5YzkES0Q), Guthrie Govan shows his pedal-board, which includes a TC Electronic Flashback Delay TonePrint Series guitar effects pedal. It says on his website that he uses the TC Electronic Flashback Delay. Brent uses a Flashback Delay pedal, according to TC Electronic's [website](http://www.tcelectronic.com/brent-hinds/). According to TC Electronic's [official website](http://www.tcelectronic.com/audley-freed/), Audley uses a Flashback Delay pedal. 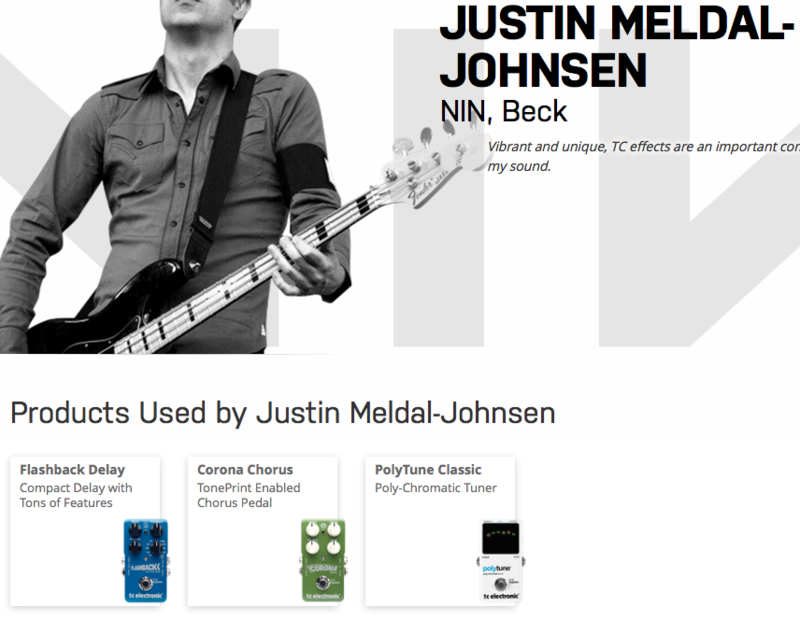 Among the TC Electronic products used by Ben Weinman is the Flashback Delay, according to [this page](http://www.tcelectronic.com/ben-weinman/) of TC Electronic's website. The Flashback Delay is one of the TC Electronics products that Phil Campbell uses, according to their website, [here](http://www.tcelectronic.com/phil-campbell/). According to Premier Guitar, Gonzalez uses the TC Electronic Flashback Delay pedal. In this TC Electronic article, McVeigh is spotted with the TC Electronic Flashback Delay. He also has his own toneprint, "unfinished business". The Flashback Delay pedal is on of the TC Electronic products used by Justin Meldal-Johnsen, according to their [website](http://www.tcelectronic.com/justin-meldal-johnsen/). "Once you have the Flashback pedal, you have your delay pedal, you have Joe Perry’s delay pedal, you have everybody’s delay pedal. It never gets old." 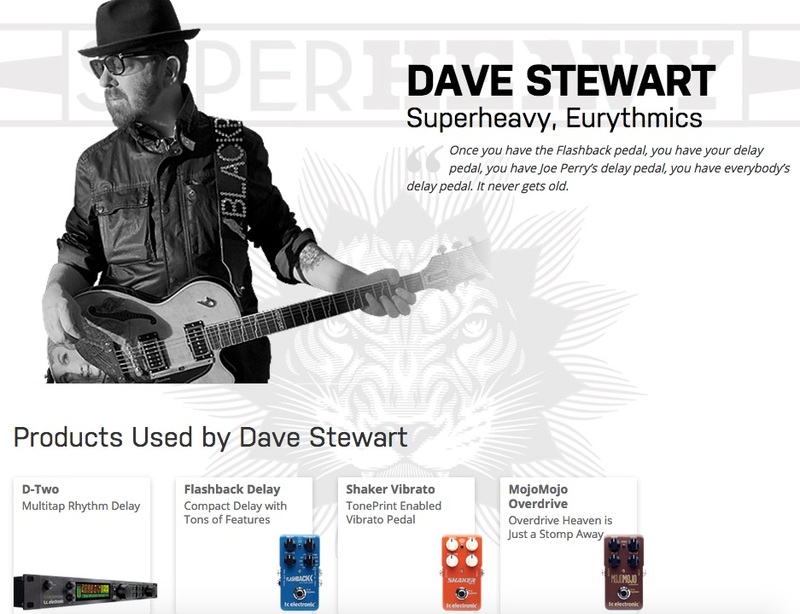 - [Dave Stewart](http://www.tcelectronic.com/dave-stewart/). TC artist page insists that Trey uses the Flashback delay. Brett uses a Flashback Delay pedal, according to TC Electronic's [website](http://www.tcelectronic.com/brent-hinds/). In this photo, on ACL's [website](http://acltv.com/2013/01/25/gear-blog-bob-mould/), Bob Mould's Flashback Delay pedal can be seen. Bryan uses a Flashback Delay pedal, according to TC Electronic's [website](http://www.tcelectronic.com/bryan-beller/). "Here's the final 'Yardboard' layout for the upcoming The Yardbirds tour starting on Oct 30th…"
In this video at 2:26, we can clearly see Edu Ardanuy demonstrating his pedalboard where we can see the TC Electronic Flashback Delay. According to the product website Reeves Gabrels uses the Flashback Delay pedal. According to TC Electronic's website, East is using the Flashback Delay. During an interview with TC Electronics, Jona talks about his padals, including the TC Electronics Delay . His board features two of these that have been repainted black. You can tell they are the same from LED placement, knob function and the unique enclousure style. One of which appears to have the effect level potentiometer removed. The delay he uses, or has used. At the 4:40 mark, you can see the TC Electronics Flashback. He said that he has two delays in his pedal board. One being the Maxon AD10 and the other being the TC Electronics Flashback. In this gear photo posted by Feerick, the TC Electronic Flashback can be seen. 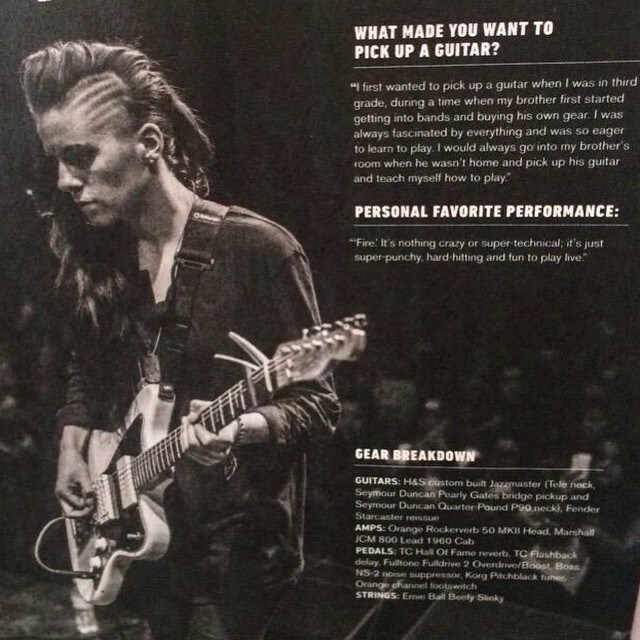 in the april issue of alternative press lynn gunn's gear is profiled and amongst other items this pedal is listed. Used with Phillip's theremin. Mentioned in source video at 0:30.
sixth pedal in the video . According to the product website Tal Wilkenfeld uses the Flashback delay pedal. The product website insists that Richard Bona uses this pedal. The TC Flashback Delay which is by far the best sounding and most variable delay that I have heard. On the product website it is stated that Niko Tsonev uses this piece of gear. According to the product website Tony Grey uses the Flashback delay pedal. Jake mentions he "just recently got this." The TC Delay processes sound directly from Minibrute. 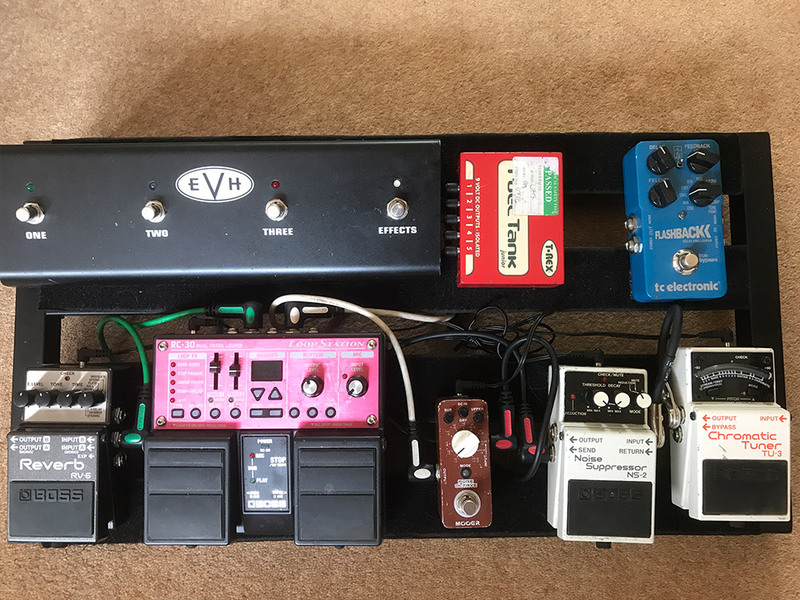 Mark King shows and plays through his pedalboard, including the TC Electronic Flashback delay. He even shows how to use the Flashback for practicing which is a cool idea. In this picture of Jimmy's pedalboard, you can see his TC Electronic Flashback Delay. Delay and looper, lo uso como ultimo pedal de la cadena. A TC Electronics FlashBack Delay pedal can be seen in this photo-shoot of Survive's home-studios and practice space, spotlighting the gear they use. As per source from TC Electronic's musician profile, Syu is known to use a Corona Chorus, Vortex Flanger and a Flashback Delay. fazerdazePlaying guitar for @gareththomastunes tonight at @thegoldendawntavernofpower. $5, doors 9pm ???????????????? During his time in Undivide, Leda has released an album called "Materials Left Aside." One of the songs in the album, "White Hole," featured an ambient chorus/delay sound in the intro section. In this video, Leda is seen tone-printing his custom settings for the chorus and delay. "Fantastic sound delay, plenty of options in a small pedal. Big fan of tone print function also!" 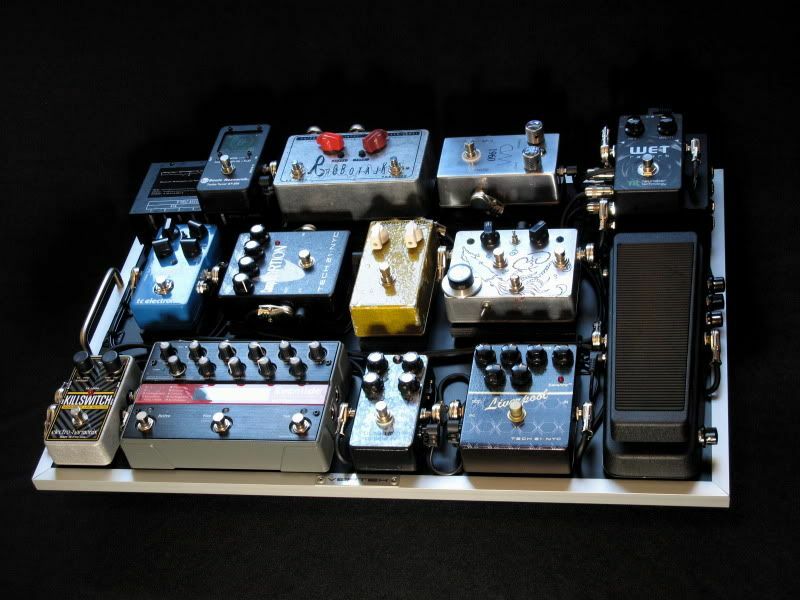 The pedal can be seen in this Facebook profile photo. The pedal is seen in this Instagram post. Visible (but not discussed) on Jim's board for the first half of the video. Luke Weiler of Positive Mental Trip has been known to use many of the TC Electronic 4 knob Toneprint pedals. Luke is rarely seen using the TC Electronic Flashback V.1 live but it has been used on many Positive Mental Trip recordings since 2017. The TC Electronic Flashback Delay Guitar Effects Pedal features 6 seconds delay time of every delay type you could ever wish for, from TC Electronic's legendary 2290 to a slapback, with 10 different types to choose from and it also doubles as a looper. Besides all that, the Flashback delay comes with TonePrint, so you can easily ToneTransfer your favorite delay settings. The Flashback delay also features TC Electronic's audio tapping technology, allowing you to set delay times by strumming your guitar, and a toggle switch allows you to switch between 16th notes or dotted 8s, for a more U2-like sound. First, it's worth noting that the sounds in this little blue box are great. The effects blend with a signal very well, allowing for the instant creation of lush atmospheres or just adding a little color to the sound of a wailing solo. However, I personally found the tones a little thin-sounding, compared to the rich analog tones of EHX's Digital Memory Boy or even the Line 6 Echo Park's tape echo model. The TC Electronic delay is, by comparison, remarkably clean but this comes at a cost to the character of the pedal. Second, some of the pedal's innovations are a little clumsy. For instance, the idea of letting a player use their hands to set the tap tempo is a very good one considering that most guitarists spend a lot of energy working on their timing. It's likely that your strumming hand has better timing and control than either of your feet. However, having to hold down the FlashBack's footswitch for two full seconds to access the tap tempo is a real buzzkill. In a live performance situation, having your signal muted for as long as it takes to tap in a new tempo leaves a very noticeable gap in the mix. Also, while you are only required to hold the footswitch down for two seconds, this feels like an eternity onstage! With that said, the Looper feature is one of the easiest to use of any I've ever encountered, although it does require that the player have pretty good foot-timing because there's no built-in quantization. The pedal starts recording the very instant you hit the footswitch, and starts playing as soon as you step on it again. However, with a little practice it's quite simple to get used to and before long, you'll be layering loops like a pro. My only qualm with the Looper is that one can't use a delay sound at the same time as looping, but this limitation is logical and not a deal-breaker. The only feature I'll say I dislike outright on this pedal is the fact that the switch used to toggle trails on or off ("trails" referring to echoes continuing to occur after the pedal is turned off) is hidden in the pedal's chassis. To access it, you have to pick up the pedal and use a coin or some other large, flat implement to unscrew a panel on the reverse side of the FlashBack, inside of which you'll find an on/off switch. It seems to me that even mounting this as a toggle on the side of the pedal would have been a better idea than putting it under and inside of it. I really enjoyed your review and it made me think again about buying one of these or the alter ego... maybe I need the big version of these pedals to be able to tap my delays right, the strum feature sounded cool, but you made a great point about the gap in the guitar parts while you stomp, wait and then strum. And 'thin' sound is worrying too. Then again would probably use it true stereo into a distorting amp. Might thicken the tones up. I just bought the Flashback 4x, which is by far a superior pedal. The sounds are still killer--same thing, obviously--but the extra footswitches make it way more user-friendly. The dedicated tap tempo and separate effect on/off switches alone are a massive improvement. Only some of the tones are thin-sounding; most (especially the ones with modulation) are simply gorgeous. None of them feel as thick as a straight-up analog pedal does, but with that said, the "analog with modulation" setting is incredibly musical and very, very addictive. Highly recommended. Do you have any of your own music on your soundcloud? I'll do a review of the FB4X soon. It's a terrific pedal with arguably only one design flaw that I've found after 2 gigs with it (and even that is debatable). It's one of the best delays I think I've ever owned, and I've probably had one of everything under $300. Kills the DL4 IMO, although again, your mileage may vary. If you're an analogue snob go pick up the Carbon Copy. If you're reading this chances are you're already comparing. It does what it does better than the Flashback, but that one trick pony can't do a tenth of what this pedal does. So if you're just looking for pure delay get the Carbon Copy, if you're looking for a staggering amount of options and sheer versatility, this pedal belongs on your board. All the usual delays are here. Plus the Toneprint allows others to be downloaded. I use it as a secondary delay with my M5. Sounds great, compact too. This delay can do anything. The presets and all of the interesting functions that they built into it are cool, but the the Tone Print ability is what makes this incredible. You can program your own delay on your computer and send it to the pedal! amazing. Not only does this have tap temp (technically 'strum tempo'), but it also has 12 types of delay in addition to a switch for divisions and a built in looper. Strongly recommend. This is by far the most versatile, compact, and pro quality delay pedal I've ever played. I went through a lot of delay pedals before I found this one and it has been a staple on my board for over a year now. This is one of the few pedals that if it broke, I would run out right away and buy a new one. Tons of tweaking ability inside and a wealth of clear delay sounds inside. It may sound stupid, but I like the way the footswitch feels. It's smoother and doesn't audibly "Click" when you engage it. Tons of possibilities. Trust me, you need this pedal. You have so many different delay effects at your disposal. You can also download a TonePrint from your favorite artist on the TC website. Awesome product. or program your won toneprints ground up with the software. Toneprint series pedals are great! A great delay pedal with versitility and a great price, toneprints are fun! You never get bored of your sound with this one, you can always download a new toneprint. I have been obsessed with making toneprints for the X4 I just bought! I wish I had more free time. These pedals sound darned good and are funa s heck to tinker with. Once you get something you like you can just save it and recall it whenever you want. Awesome. An amazing and adaptable delay pedal. After struggling through a few smaller gigs with my Line 6 DL4, I needed a delay pedal that delivered the brilliance of the DL4 but did not take up as much space as the famous green pedal. I came across this Flashback pedal through Rob Chapman and boy has it helped me significantly. This amazing pedal will give you all of the great delay tones as well as a few more than other delay pedals. Extremely simple to use and a brilliant pedal all round. Able to emulate analog or digital delay tones. It's also possible to update it on the website with presets. The sound quality is perfect! the original sound is not modified at all (analog dry through) and the feedback added sound has great quality too. I found myself playing for hours with very different sounds and effects....... It has tons of features: the "2290" is an excellent modern delay; "analog/tape/slap" are different kinds vintage delays; the "modulation" delay provides a chorus in the feedback (set the time to zero and you'll have a nice chorus); "Ping Pong" is great for alternating delay repeats from left and right channels; "Reverse/Dynamic" are fun. The looper is too basic but it can be interesting if you don't have other loopers. Don't count on it if you are serious about looping (can't undo, can't stop and start the last recording, can't separately control the recorded volume without affecting the main volume). The Tone Print feature is amazing if you are friend with computer and cell phone apps. It allows to configure the pedal in ways you wouldn't imagine. The pedal is great for home & studio. For live performance, the disadvantage is that you can't store multiple presets, so you need a couple of seconds to configure the sound you want. I'll move to TC Flachback X4 or TC Tripple Delay in the future for sure. This is by far one of the most amazing DELAY pedals i've used so far! TOne print is really something! It has a huge variety of echo and delays, and with tone print you can program it with your phone. Very usable preset modes, and the versatility of TonePrint makes the TC Flashback a staple on my main board. And it's stereo. The variety of delays on offer is unbelievable. When I bought it, I initially thought that I would end up keeping it at the 2290 setting, but after a few days of playing, I found that every setting was extremely usable and sounded great. Even with the delay turned down, the pedal added just a bit more saturation to the overdriven sounds, giving it a lovely little boost and smoothness. All of this, plus the built-in looper and the fully customisable TonePrint setting, comes together to creat a fantastic pedal. yeah, I got the X4 version for the 2290 and lofi and have wound up using Tape and analog, they sounded pretty legit to begin with but thanks to the toneprit software I have tweaked my own presets for both that sound really right to me. Software or this is fun and easy to use and EXTREMELY powerful. Exactly! I've found that I keep coming back to the Tape and Mod. Soooooo many options. Don't know which delay type you'll want? Take the Flashback, it has them all, and if for some reason you still can't find the one you want? Toneprint. Genius. My main critisisim is the tap tempo. You hold the button which mutes your signal, and you strum to the tempo. Useful, don't get me wrong, but only if you already know you want delay in that sound and have time to set the tempo. No use for last second "Delay would sound great here" moments. Great pedal, but could use a re-issue with the tap-tempo addressed. Have only owned this for a couple of weeks but it will surely hang around for quite some time. As a bassist I don't want my pedalboard to be overflowed with big delay pedals like the Strymon Timeline or TC Electronic Triple Delay. They sure are really great pedals but for my use it's a bit too much, although this pedal is spot on! It gives great sounds with classic delays like the 2290 and three different subdivisions which gives me great versatility, even in this small format. If you want just a small but solid delay pedal or maybe you just want another option alongside your big delay pedals then this is the way to go. Heaps of versatility and doesn't break the bank! The possibilities are endless with this pedal. Only down side is the lack of tap tempo but in its small size I can see why. "I like this pedal because all delay types are here. I use the analog type of sound for my added sauce when I am playing." This is in many ways the opposite of the sound of Boss pedals. This has character and attitude. A lot of great sounds at your fingertips and even has a looper! Toneprints provide lots of options. With TonePrint app on desktop - you can use more than just Delay unit. Its modulation effect for various kind of effects. Now I fund more intresting digital delay for my needs. But I love flashback (not close analog delays) but very useful delay. i love the tape, mod, reverse, and slapback modes the most, and the audio tap feature is nice, although i wish i could use my foot as well. that deserves one star off. the other thing is that you can't do the wacky pitch shifting and time shifting effects by turning the delay and feedback knobs! always a fun thing to do, especially for recording. i can of course live without that, and for the models and the sound of the delay, the stereo in/out, the audio based tap tempo feature, the subdivision toggle, and of course the price point, this is a really solid delay to have in your setup. I have and i like this pedal 'cause its very versatile. A lot of types of delay, including the analog delay, that sounds very niceee , switch to select the style of repeatings, etc etc. True bypass. Stupidly versatile and fantastic for the money, if you need lots of delay sounds, this i the one, great for small and big boards a like!